The tripartite facing board of the table holds three mirrors--one in the center bigger than the ones on either side, and symmetrically placed. Most curious was the figure in the roundel above the frieze sheltering the two smaller mirrors: a long-haired, long-bearded man with eyes closed and an afflicted expression on his face. The figure seemed very Jesus-like. This is the only anthropomorphic figure on the elaborately carved table. Hopefully more on this table soon! Closer Look: Can the Central Emblem on Padmanabhapuram Bed Tell Us about its Origins? One of the most fascinating aspects of the bed at Padmanabhapuram is the central motif on its head and footboards--a curious mix of European and Indian mythological elements. At the center, enclosed within a stylized ficus-leaf-shape, one finds a handsome serpent wound around a staff. The serpent around a staff is easily identified as the symbol of Asclepius, Greco-Roman god of medicine. (I have had discussions in the past with some scholars who thought differently, more on that here.) The serpent and staff are book-ended by a wide-winged eagle atop and a Kirttimukha (face of glory), both objects associated with protection and guardianship in Hindu visual culture. If you look closely, however, the staff itself is, curiously, not a staff. Rather, it is a cross (and a particular kind of cross at that) held at the bottom of its shaft by a pair of human hands (right above the kirttimukha's crown). The subtlety with which Christian and Hindu imagery were brought together for the specific purpose of blessing the king is striking indeed, however, in the type of cross depicted perhaps lies a clue to the identity of the school of artists who produced this bed. It took me a couple of visits to the bed to notice the pair of hands holding the staff-cross. What struck me is that the way in which these hands hold the staff is particular: when we usually hold something like a stick or a staff we hold it with both our hands clasped in the same direction (figure 1 below). But the pair of hands seen on the headboard is clasped differently, like in figure 2. This is a specific way of holding something in front of you to hoist it up high as well as to balance its weight centrally for a longer period, like a banner that the leader of a band might hold, for example. The formality of this gestures made me wonder: could it be that the pair of hands is holding something of honor in a procession, perhaps a processional cross? Christianity practiced along the Malabar Coast was mainly Catholic in ritual although there were older Syriac Christians in Kerala from around 52CE. (For a really great introductory survey of Christianity in India until the early modern period, see Gillman/Klimkeit's Christians in Asia Before 1500 UMich Press, 1999.) Many of the Christian rituals on the Malabar Coast followed Catholic liturgical rites that included spectacular festivals and processions, that continues today. Processional crosses, much like Hindu temple processional idols, were carried in front of these processions. My initial guess was that the bed was not produced in Travancore but brought from Fort Kochi (Cochin), the stronghold of Europeans on the Malabar Coast. (Fort Kochi was a safe haven for the Portuguese, and after they were ousted in 1663, it remained under the Dutch until 1795, when Holland ceded all its dominions in India to the British following William V's Kew Letters.) After all, why would the Europeans gift a powerful potentate of the region a bed, medicinal as it may be, from his own kingdom?? My hunch, I found, was supported in the essays of an early-twentieth-century Danish curator of Indian furniture, Wilhelm Slomann. His essays in Burlington Magazine from the 1920s mentioned, in passing, that an active trade center producing export-furniture existed in "Malabar". (I take this to mean Cochin because if it was the southern Malabar coast, Slomann would have addressed it as Travancore; Malabar in twentieth-century meant the British-controlled portions of Kerala to the north of Travancore.) Indeed, a bed that he claims as made in Southern India, looks, at least in basic organizational framework of its design, similar to the Padmanabhapuram bed. My hunch has turned into a tentative argument with the analysis of the staff-cross. If you take a close look, you will see that the cross has two perpendicular prongs on top. The shorter prong above the longer one, connects the two upper ends of the stylized ficus-leaf frame that surrounds the serpent-wound cross. With no archival documents uncovered thus far (I hope to get hold of Dutch Malabar documents this Fall) it is hard to be absolutely sure, but I contend that the cross resembles the famous Coonan Cross of Mattancheri in Fort Kochi. Coonan Cross holds special significance for the Malayalee Christians of central Kerala. It was in front of the cross of Our Lady of Life Church, in 1653, that the St. Thomas Christians of Kerala broke into two factions, one who accepted Latin rites brought in by Portuguese Jesuits, and the other, called Malankara Christians, returning to their older Syriac faith. For Malankara Christians, Coonan Cross where the oath was taken held special significance, and with time, it became a place of pilgrimage for local Christians from central Kerala. The staff-cross on Padmanabhapuram bed's headboard, I suggest, was based on the Coonan Cross from the distinct formation of this cross that is not seen elsewhere on the Malabar Coast. It leads me to make the claim that artists local to Mattancheri in Fort Kochi made the bed since the cross was peculiar to Mattancheri, even today. This would also make sense considering there were direct sea route and ships available from Fort Kochi to various ports in Travancore, by which the bed could have reached Padmanabhapuram. Further research will tell us more but if this holds true, two things unknown thus far about Kochi society comes into play. First, various Christian denominations continued to work with one another, and if these artists were Malankara Christians, it could be possible that this denomination occupied the lower rung of society, since their Hindu counterparts were considered lower caste at this time. Second, the traditional understanding of the Kerala artist have placed him as categorically Hindu, working for the king and the temples. While we have known about export furniture business and furniture-making geared for the European markets from the works of scholars like Amin Jaffer, we do not have information about these people--who they were, how they worked, organized, and lived, or what strata of society they occupied. So I am looking forward to learning more about this artisanal class. *If you have any information on this bed or beds similar to this one, drop me a line! Dating Woes: Where and When in the World was Marthanda Varma's Legendary Bed Made?! From 2009, I have been trying to figure out when exactly the bed at Padmanabhapuram palace in Kanyakumari distict, Tamil Nadu was made. Known as Maharaja Marthanda Varma's bed, this remarkable object of majestic stature and intricate craftsmanship is a popularly associated with the legend of Marthanda Varma, called "the maker of modern Kerala." I know, I know, if it is Marthanda Varma's bed, then what's the big mystery! It's easy to think that this bed, must have been made around the time of Marthanda's rule between 1729 and 1750. But, as it turns out, in my many years of inquiry with the state archaeological department, senior archaeologists, historians, everyone at the palace from director to security guards and janitors, I have not only found no conclusive evidence, but instead, I have been told conflicting stories of the bed's origins. Talk about legendary! Most people I have spoken with are of the opinion that the bed was a gift from the Dutch East India Company officials in Malabar, although a minority have mentioned Portuguese Jesuits as the bed's donors. At one point, a wooden painted board, advertised this fact to the touring public (see image below) but it has been taken down since. Part of the information provided on the plaque we know is factually incorrect: there is no "Captain Adrian Van Goens" working for the Dutch East India Company (VOC) in Malabar. There was, however, a Hendrik Adriaan van Rheede, a VOC commander stationed in Dutch Malabar in mid-seventeenth century, who worked under Admiral Rijcklof van Goens, who was central to the defeat of the Portuguese in Sri Lanka and southern India. (Note how the two names have been married to create a dashing new name on the plaque.) Commander Rheede was also a person with many interests, and like his peers entertained a scientific curiosity. Rheede with the help of some locals produced the encyclopedic Hortus Malabaricus, the first scientific compendium on India's flora and fauna published in Europe. So, did van Goens and Rheede present this bed to Marthanda Varma, then? If, as suggested by many, Admiral van Goens presented this bed to the ruler of the region, then it was definitely not the illustrious ruler Marthanda Varma mentioned here. It could be the little known potentate Aditya Varma, whose name I have not seen anywhere in the annals of Kerala history, except on a dubious website that charts a genealogy of "Hindu" kings of Travancore. In reality, we have little to no information at present about seventeenth-century South Kerala until 1677 when a queen, Umayamma, comes into power at Attingal and signs treaties galore with Europeans. So why then, would, the Dutch East India Company officials lug a really heavy bed all the way to the tip of South India, to produce it as a gift, to a hardly known political figure, whose capital was in Kollam, a good 75 miles north of Padmanabhapuram palace? While I am still seeking answers to the art historical mystery that is this bed, I have discovered in the last couple of years, the existence of similar beds in Portugal were they have been categorized as "Indo-Portuguese" furniture from eighteenth century. Indeed, in its choice of motifs and stylization, one of these beds that I have seen in person in Sintra Palace Museum in Portugal, have a lot in common with the Padmanabhapuram bed. Recently, I have taken another stab at analyzing the origins of the bed and you can read more about that here. For now, from my analysis of the bed, I suggest that this bed was probably given in the eighteenth century to Marthanda Varma by Dutch East India Company, since they were the most powerful European group in Malabar Coast at this time. Further, Marthanda Varma's reign saw multiple battles with VOC, culminating in the defeat of a VOC garrison in Colachel in 1741. (Many historians of Kerala proudly claim this event as the "first defeat" of a European army by an Asian king; I have my reservations about calling the event at Colachel a battle.) Indeed, it was after Colachel that the Dutch agreed to sign a treaty of peace with Travancore, a diplomatic maneuver that took many years between 1741 and when it was officially signed it 1753. Perhaps, the bed was a gift that accompanied one of the drafts of this treaty? Parting note: in a separate post, I have argued that this bed was made in Fort Kochi in central Kerala. You can read about that here. Closer Look: Is it Asclepius or Mercury on the Padmanabhapuram Bed? The central motif on the headboard of the Padmanabhapuram bed is a cornucopia of mixed motifs from European and Indian mythologies. You can take a closer look at the headboard in my photo essay; in this post, however, I am exploring the central icon of the serpent wound around the staff (or as I have argued elsewhere, the staff is actually a processional Christian cross). A few years back, a professor of early modern Northern European art history suggested that the serpent around the staff is Mercury, the Roman god of trade, a mythological figure that was especially popular with the Dutch traders who spent their lives on maritime routes. 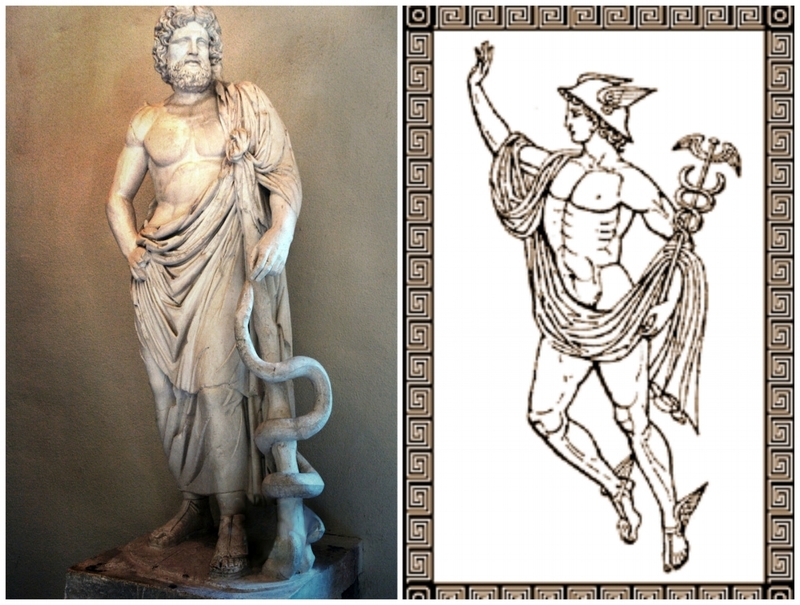 This appears to be not the case, since Mercury, a Roman successor to the Greek Hermes, took on all of the latter's characteristics including the association with Caduceus, a staff around which are found two serpents (image on the right). Left: Greek God of Medicine, Asclepius, with his Rod; Right: Mercury with his staff, the Caduceus. The helpful professor, however, insisted that, like the US medical institutions, early modern ndian artists who produced the bed, made a similar mistake, in reverse, misinterpreting the rod of Asclepius to be the Caduceus. It would make more sense for European traders, she said, to present a gift that symbolically represented trade than a gift of health to a rival "native" king. I had nothing concrete at that time to counter her argument. But recently, upon examination of the bed, I have found that the bed is made of many different kinds of woods, some easily identifiable as tropical woods said to possess various medicinal properties, such as Neem (Indian Lilac), Arayal (Ficus Religiosa), and Kanjiram (Poison Nut Tree). * These woods also appear to be placed by design to affect and heal the user. For example, Neem is used at the very top of the cot and towards the middle were the abdomen of an average-sized user would rest. This would seem an appropriate placement of this wood as Neem tree's bark is considered a traditional diuretic and lauded for its ability to detoxify blood. Further, the Dutch, especially, were known to have had a strong interest in Kerala's horticulture. One of the earliest scientific enquiries of India was the Hortus Malabaricus (Garden of Malabar) produced by the Dutch East India Company under the leadership of Hendrik van Rheede, the Dutch Governor of Malabar from 1669 to 1676. I am inclined to argue that the reading of the bed as a "medicinal cot" is accurate given these associations. *The identification of woods that make up the bed is an on-going process. Some of them are more easily identifiable than others. I thank the palace manager and resident historian of Padmanabhapuram for his continued help in identifying wood-types.